The ‘Regal’ and Shelz development has been given planning consent. The plans approved differ from those consulted widely upon in a number of respects. The cinema operator is now Rio Cinema. This is a small cinema company which has existed for over 100 years and runs the Rio Cinema, 107 Kingsland High Street, London E8 2PB. It has a very good reputation for working with the local community to meet their needs. Their web address is: riocinema.org.uk. The development, as approved, has only two cinema screens instead of the three in the original plans. The number of flats reduced from 34 to 30 but some of the flats are now duplex apartments. Any development, such as the ‘Regal’ development, which includes homes must provide parking for those homes; unless it is within a Controlled Parking Zone (CPZ). This development has no parking provision and is not within a CPZ. So the Council attached a condition to the planning consent requiring the developers to contribute £40,000 towards the implementation of a CPZ. This will be the sixth time that the Council has proposed a CPZ for Highams Park and in the past it was soundly rejected. The last time (three years ago) it was rejected by 80% of the residents (the Council’s figure). A CPZ would not be effective as there is no planning condition preventing the residents of the new flats from applying for a permit and, as the TESCOs development proved, the Council will sell as many permits as possible, whether or not enough spaces exist. Watch out for yet another attempt by the Council to introduce a CPZ in the centre of Highams Park. Another condition of the planning consent for the ‘Regal’, is that the triangle of land, in Beech Hall Road, at the corner with Hale End Road, belonging, to the ‘Regal’, be transferred to the Council (free of charge). 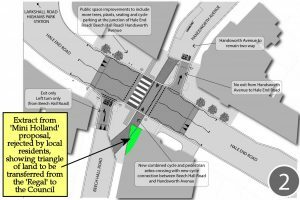 The triangle of land is key to the ‘Mini Holland’ changes to the junction at Hale End Road, Beech Hall Road and Handsworth Avenue. You may remember that as part of ‘Mini-Holland’ programme, the Council had proposed changes to the junction at Hale End Road, Beech Hall Road and Handsworth Avenue. Unfortunately, their proposal would have had a disastrous effect on local traffic and the surrounding road. The proposal was soundly rejected by the Highams Park residents in a ‘Mini Holland’ consultation. The ‘Mini Holland’ team were to rethink their proposal and present a new proposal for consultation under the ‘Mini-Holland’ programme. This has yet to happen. However, the planning recommendation document for the ‘Regal’ refers to a highway plan to be submitted and agreed which will incorporate…Relocation of exiting zebra crossing,…Treatment of the junction with Hale End Road and Beech Hall Road to improve conditions for pedestrians and cyclists. This sounds like the original ‘Mini Holland’ proposal already rejected by the residents of Highams Park. 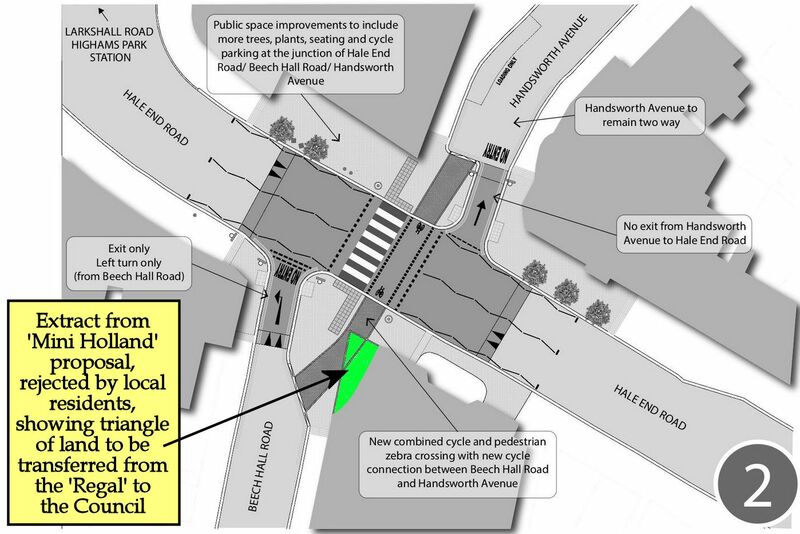 Any proposal to alter the junction at Hale End Road’ Beech Hall Road and Handsworth Avenue should be subject to consultation under the ‘Mini-Holland’ programme, as already promised.